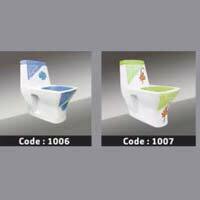 Indulged in the customersâ�� needs with excellence, we are involved in offering One Piece Toilets. As a leading Manufacturer & Exporter, we offer a superlative quality range. They are made of top drawer raw material. Their robust structure and alluring design make them an enticing proposition for the customers. For our esteemed customers, we make them available at easy on the pocket rates. This range includes Plain One Piece Toilet and Designer One Piece Toilet.